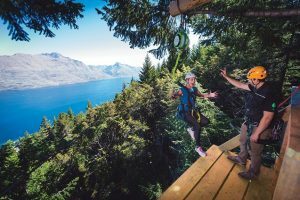 Find your wings, fly like a bird and zoom through the treetops before a swooping 21m drop – welcome to the latest eco-thrill from Queenstown tourism company Ziptrek Ecotours. The multi-award-winning company is taking the thrill factor to the next level with its Kereru 2-line + Drop Tour, announced today (Wednesday December 6). The new tour is in addition to its four-line and six-line Moa and Kea tours, and for those not in the know is named after New Zealand’s iconic (and somewhat large) native wood pigeon. The Kereru is known for the distinctive sound of its wing beats in flight, precarious landings on branches, and is somewhat famous for getting drunk on berries and dropping out of trees, which inspired the Ziptrek team to name the tour after the Kereru (pronounced ‘care-re-roo’). The tour is a whole new way to experience Queenstown for those looking for a heightened thrill level of a unique adventure in the shortest amount of time. 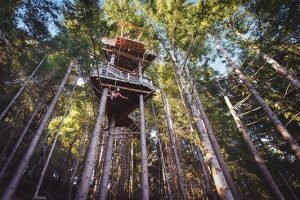 It includes two existing ziplines through the trees and a 21m drop to the forest floor. As part of the tour, passionate guides tell the fascinating conservation story of Zealandia’s creation and Ziptrek’s role in the preservation of the natural landscape, removal of invasive species and protection of native wildlife, fauna and flora. “We’re giving guests the opportunity to ‘find their wings’ and finish with a swooping drop that leaves them a fledgeling no more,” said Ziptrek sales and marketing manager Nicky Busst. “Over the years we’ve had some feedback from guests who are time-poor but would love to zipline, so we’ve developed a totally innovative tour that enables them to enjoy the best Queenstown experience on offer in just under an hour. Ms Busst said the Kereru Tour would cater not only for new visitors but for Ziptrek’s many repeat customers who wanted to come back and try something different. She said naming it the Kereru Tour fitted perfectly with Ziptrek’s ongoing conservation ethos and work with the Routeburn Dart Wildlife Trust. “The Kereru is a protected species so we’re also working closely with the nearby Kiwi Birdlife Park which runs a Kereru conservation programme, with wildberry trees planted in the landing area as a ‘kereru garden’ to encourage them to visit a safe natural habitat,” she said. For a ‘taster’ of the new Kereru Tour go here. The new tour costs just $95 and is available from February 1 2018 (bookings commence soon by phone, email or through its websitewww.ziptrek.co.nz.) Minimum age is 10 and tours take a maximum of eight people.